Michael Kors was always good for a hilarious critique of someone's haute couture disaster when he was a judge on the reality show "Project Runway." But the tables have turned. Investors are now trashing the fashion company that bears his name after its latest disappointing results. 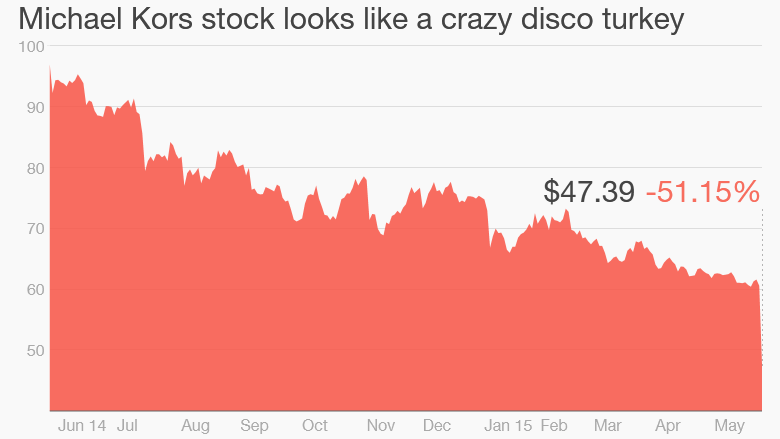 Shares of Michael Kors (KORS) plunged nearly 25% Wednesday to their lowest level since December 2012. It's the Wall Street equivalent of a hot mess. Here's something that should make Kors truly gasp in horror: same-store sales fell more than 6% in North America. That's awful. And the company's sales and earnings outlook for the full year is well below forecasts. What went wrong? Michael Kors was a red hot stock in 2012 and 2013 following its initial public offering in late 2011. But tough competition in the handbag market from the likes of Coach (COH)and Kate Spade (KATE) have hurt the company in the past year. The company is still reporting sales growth in the handbag market. But CEO John Idol conceded in a conference call with analysts Wednesday that the market in North America is "definitely growing more slowly than it grew in the past." Handbags aren't the only problem plaguing Michael Kors though. Broken watch: Accessories are often the biggest money makers for luxury retailers, but the company said during the conference call that watch sales declined in North America during the quarter. Shares of watch maker Fossil (FOSL), which has a partnership with Michael Kors, sank 5% Wednesday following those comments. And the stock of luxury watchmaker Movado (MOV) fell 2% after it reported a drop in sales and profits for its most recent quarter Wednesday. "We will capitalize on wearable technology in watches and other categories as innovation and demand in this area continue to advance." It also seems that Michael Kors may have gone overboard with store openings. Overall sales in North America were up in the quarter, but that's solely because of the higher store count. "The company has expanded too successfully and is now finding it harder to penetrate further," wrote analysts at Conlumino, a retail research firm, in a report about Michael Kors Wednesday. "The main warning for Michael Kors is one we have seen before: luxury brands that enjoy meteoric rises can also suffer from overexposure." Related: Who exactly is the Apple Watch for? Foreigners aren't buying: But Michael Kors has an even bigger concern than market saturation. And it's one that it can't control. The strong dollar. Executives said that visits to stores in New York, Las Vegas and parts of the Southeast suddenly dropped once the euro began to decline against the dollar this year. Europeans were apparently less willing to fly to the United States to shop since they could no longer take advantage of a strong euro and do some bargain hunting. 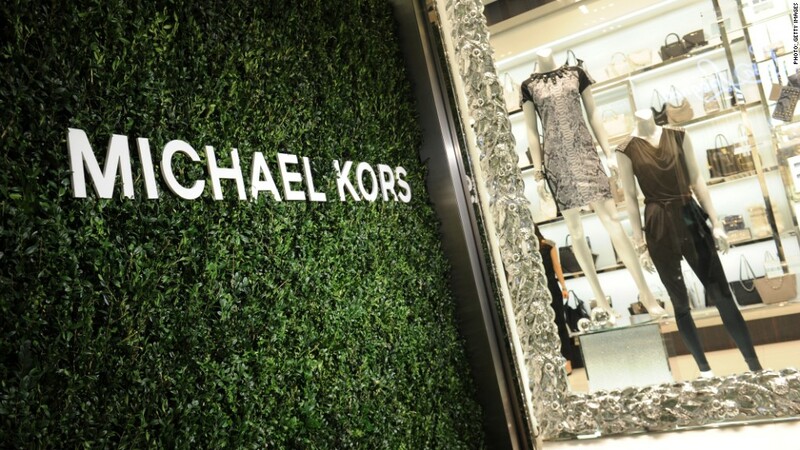 Michael Kors is not the only high-end retailer that's suffering due to the greenback. Macy's (M) has also suffered due to a decline in tourism. Even though shares of luxury jeweler Tiffany (TIF) soared after it reported earnings Wednesday that weren't as bad as expected, the company said that lower tourist spending continues to be an issue. So unless the dollar starts to strengthen -- or U.S. consumers decide they want more watches and handbags -- then Michael Kors stock may continue to resemble one of his best one-liners from his "Project Runway" days. Toilet paper caught in a windstorm.